Say you want to retrieve music stored on your iPod while you're on the road ... or at a friend's? Did you lose all your songs while reformatting your hard drive... therefore needing to retrieve all the music files located on your iPod? Pod Manager is the perfect application for these tasks! How to use Pod Manager? Download this file to freely test PodManager. It can also be used as an updater for registered users. 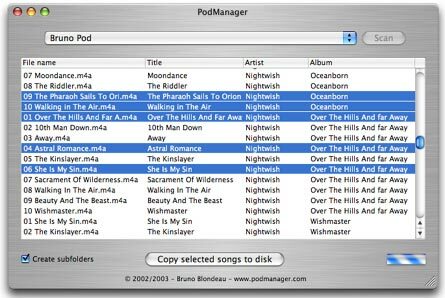 Please note that PodManager only works with MacOS X and isn't compatible with Windows.